You are at:Home»Category: "Exclusive Surveys"
A look at what age people consider “old” based on their own age. 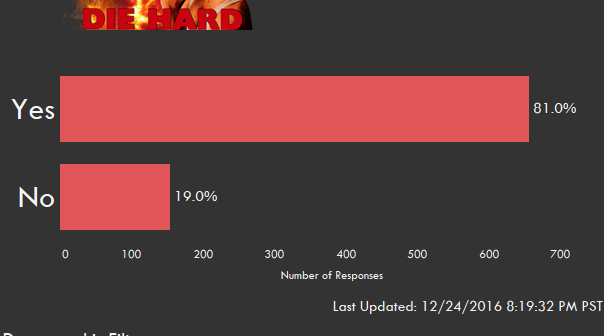 A look at whether or not our survey respondents consider Die Hard a Christmas Movie with the ability to filter by a few demographic traits. What Time did you have Thanksgiving Dinner? We asked people when they eat thanksgiving dinner here are the results. Earlier today I published the results of my survey of r/samplesize and r/nfl. The post was suppose to provide intuitive tools that simply displayed the data that I gathered on who people’s favorite NFL team is. The response that I got back about the visualizations, made it clear that this wasn’t the case. Last week we decide to ask r/samplesize and r/nfl who there favorite NFL Football Team is. We were extremely happy with the response and were able to gather nearly 1,500 responses. Below we have presented the results of the of the survey.